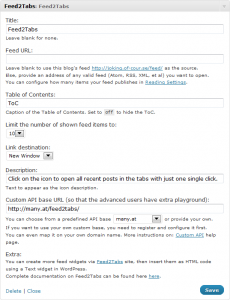 Due to high popularity Feed2Tabs was ported to WordPress for easy use. Now anyone can have Feed2Tabs widget(s) and short codes on their WordPress blogs in a matter of few clicks. Below go instructions on where to download, how to install, and how to use the plugin. Download the most recent version from WordPress repository. To add a widget: simply go to Appearance -> Widgets and add Feed2Tabs. To add a link via a shortcode, insert [Feed2Tabs] in any post or page. Please see more details in the Description section. Once installed, there are two ways to add Feed2Tabs links: via widgets or via shortcodes. If you want to use advanced option, configure and save. 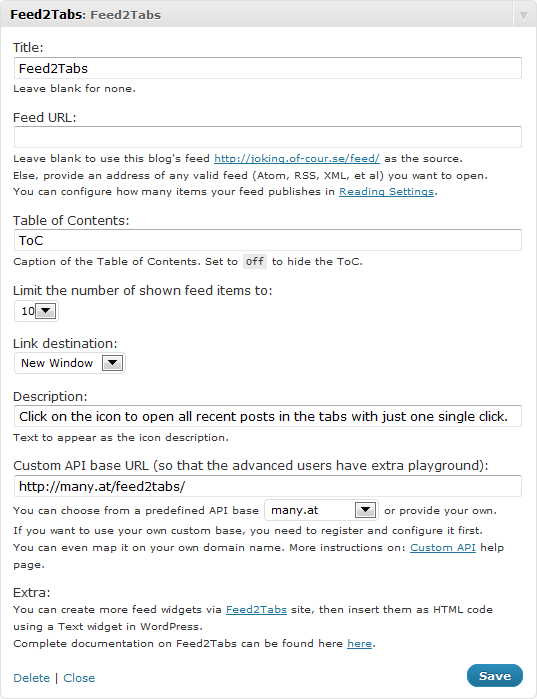 With [Feed2Tabs] shortcode one can insert Feed2Tabs links directly from any post or pages. E.g. Here is my super [Feed2Tabs]. Here is my super [Feed2Tabs title=Feed toc=off]. You can open 10 top sites at [Feed2Tabs title=Delicious source=delicious.com toc=off] with just one click. For those that want to configure custom API base and even map it on their own domain names, instructions can be found here. Q: Can I link to another RSS? A: Yes, just provide the valid URL for the feed source. Q: Can I have many widgets for several different RSS feeds? A: Yes, you can. Just drag Feed2Tabs template box to the widget area and configue all instance accordingly. Q: What feed types do you support? Added a note that WordPress 3.0 is the minimal version. Adjusted width of the setting inputs for WP 3.2. This is a great plugin, give it a try. Users using WP below 3.0 should upgrade. If you want to translate this plugin into your language, please contact us. 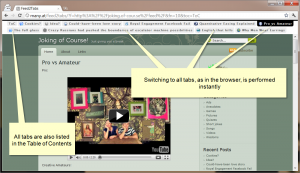 Check out the companion plugin Links2Tabs. Name.ly offers your WordPress blogs and many other services allowing to consolidate multiple sites, pages and profiles.